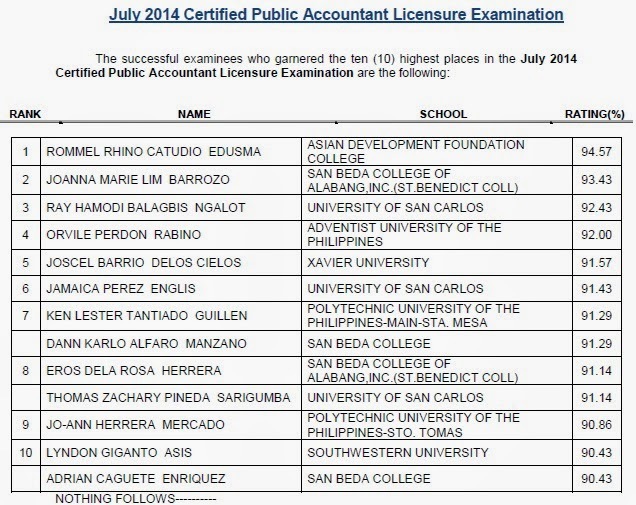 The Professional Regulation Commission (PRC) announced on Friday, August 1, 2014 the full results of July 2014 Certified Public Accountant (CPA) board exam. Rommel Rhino Catudio Edusma, graduate of Asian Development Foundation College (ADFC) topped the board with 94.57 percent grade. Joanna Marie Lim Barrozo of San Beda College of Alabang, Inc (St. Benedict College) ranked second with 93.43 average grade.